A private deck, a new spa, elegant western-inspired decor, and sweeping views of Bear Mountain make this Big Bear Lake log cabin an ideal destination for families and couples seeking a relaxing alpine getaway. This two-bedroom home is beautifully situated only half a mile from Bear Mountain Resort, where visitors will find 12 ski lifts and a terrain park in the winter, as well as a golf course and a mountain bike park in the summer. You also have a private hot tub for soaking. The living space is full of natural beauty, from stone quartz floors to reclaimed wood accents. After a day on the slopes, guests can warm their feet by the stone fireplace, or pile on the leather sofas to watch a DVD on the flatscreen TV. No detail was overlooked in the full kitchen, which features stainless steel appliances, a pebble backsplash, and leathered granite countertops. Enjoy your meals in the open dining room for six, load up the dishwasher to handle the chores, and enjoy a glass of wine at the bar counter for three. Step outside to find a stunning tree-lined deck, which features a gas grill, a picnic table, and Adirondack chairs for sunny afternoons. And to ensure that guests unplug and spend time outside, Shasta's Moon is not equipped with WiFi. At night, this two-bedroom home can sleep as many as five guests in its lovely aspen log beds. The master bedroom features a queen bed, while the second bedroom offers a queen bed and a set of twin bunk beds. There is one full bathroom and a half-bath for guests to share. No matter the season, there is something for all ages to enjoy in the outdoor wonderland of Big Bear Lake. Swimmers, kayakers, and fishermen will find the Pine Knot Marina only four miles away, while golfers can hit the links at the nearby Bear Mountain Resort. And when the temperatures drop, skiers and snowboarders can explore 748 acres of terrain at Bear Mountain, or drive less than four miles west to ride the 14 lifts at Snow Summit. 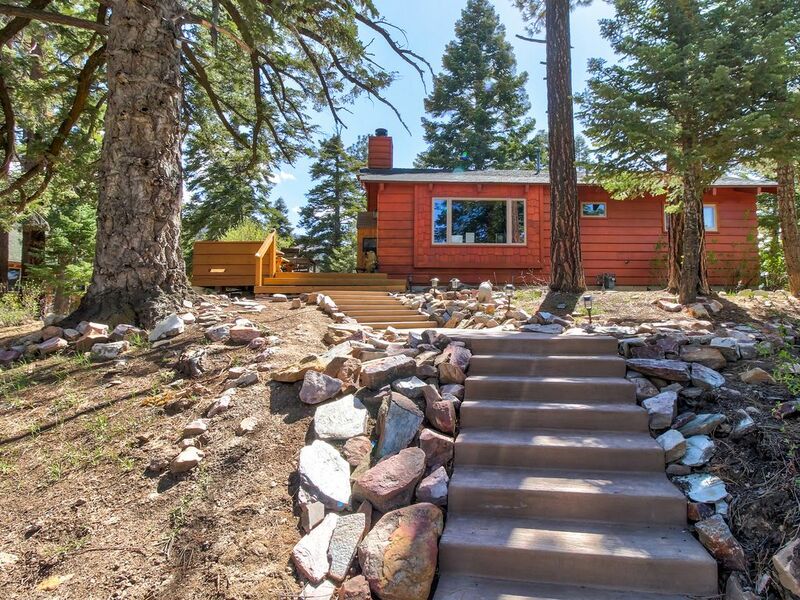 Escape to the quiet beauty of the California mountains - book this lovely Big Bear home today! Parking Notes: Parking on dirt driveway. Driveway is North facing and maybe Icy especially in the mornings please be very careful. Water Access: Pine Knot Marina is 4.0 miles (approx. 11 minute drive) from house. Pine Knot Marina offers The Miss Liberty Paddle Wheel Boat tour of the lake and Rentals: Pontoon Boats, Kayaks, Fishing Boats, Fishing rods, bait shop, Stand-up Paddle Boards and Jet skis. Bear Mountain Resort is 0.5 mile (approx 3 minute drive) from the house & Snow Summit Ski Resort is 2.8 miles (approx 9 minute drive) from the house. Because of work delays, we arrived to our the property much later than planned (9:15pm on a Friday). We were given a lockbox code to retrieve the key from the front door. It was very cold and snowy and there were no exterior or interior lights put on in the house to greet us. My husband and I both tried and tried to open the lockbox with a flashlight in the dark, but it wouldn't open. We called Vacasa and they said they'd send someone to assist, but this took an hour. We had two small children in the car that were in tears from being so tired. It turns out that all they needed to do was explain that the lockbox needed to be open in a particular way using only one hand and it would work. Had they given more specific instructions to us in the first place, or when we called to say we couldn't open it, it would have saved an hour at night in cold with exhausted kids. Then when we got in, it was only 50 degrees in the house. The house has all stone floors, so it was like walking on ice. After an hour and a half with the heat on it was still only 56 degrees. For the price of this cabin, I don't understand why someone wouldn't be assigned to come by the property the day of, turn up the heat, turn on exterior lights (or an interior one if there are no exterior lights), and make sure the property was in order. In addition to the heat and lack of light, the hot tub was full of tree debris and the driveway and steps hadn't been shoveled, despite the agreement indicating that they would be. The only condition in which they wouldn't shovel was if the street wasn't cleared by the town and/or there was still snow accumulating. The street was completely clear and no snow accumulating. We discovered the debris in hot tub when everyone was excited to get it. We called Vacasa and someone came to clean it up, but it delayed dinner and made the rest of the evening more of a rush. The maintenance person said he had checked the tub earlier in the week and it was fine, but there had been heavy winds and the top probably blew off since then. Why wouldn't this be double-checked the day we were checking in? The cabin is clean and cute and a nice location, but when I pay almost a thousand dollars for a two night stay, I expect these important details to be thought of because they really impact the enjoyment of the weekend. We apologize for the oversight of the oven and will get it cleaned right away. Thank you! Fourth year in a row. Always cozy and relaxing. New amenities like hot tub and WiFi added bonus. Will see you again next year! Very nice vacation home for big bear. Nice finishes and jacuzzi was amazing! Only wished there was a few coffee items available so we didn’t have to bring. Otherwise had all you need to cook and clean, towels etc.